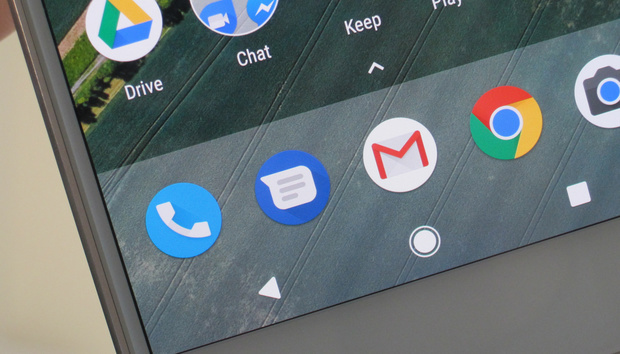 Google Messenger’s leap to version 2.0 brings a number of changes that tidy up the interface and prepare for a world of better messaging. The first thing you’ll notice is that the icon has been revamped, with a white message bubble inside of a dark blue circle. You’ll get the circular icon regardless of whether or not you have a Pixel. The dark blue icon is now more distinguished from Google’s phone app. Also, several subtle improvements bring more consistency to different parts of the interface. The conversations are grouped more tightly together, which improves on the previous iteration that felt like there was too much wasted space. Also, when you go to create a group MMS, your frequent contacts are grouped at the top while the rest are just below that. The floating action button and “send” arrow also better match the surrounding color scheme. Previously these sections were listed in two separate tabs. Messenger is more consistent and smarter in how it handles group messaging. An APK teardown by Android Police reveals an exciting development: a lot of work to prepare Messenger to support Rich Communication Services (RCS). Since the Pixel is sold by Verizon, there’s a decent chance that Google could work directly with the carrier to integrate RCS into the app. You can get Messenger 2.0 from the Play Store or sideload it from APK Mirror. The impact on you: Along with all of these improvements, it’s worth noting how many cool features Messenger has. Google's humble texting app supports GIFs, stickers, photos, videos, and of course all the Emoji your phone supports. You can easily send all this stuff to your iPhone using friends, it just arrives as an MMS, which gives them less cause to green bubble-shame you. Still, RCS is the messaging future we need, and fortunately Google is trying to nudge it along.